After 23 years in high stress executive roles Tracy Martino decided it was time to expand her career, to discover her truth, and understand her purpose. This process took 8 years as she researched NeuroLeadership, Neuroeconomics, Heart Intelligence, communication and human performance. Her discoveries inspired me to create her program, Executive Returns. 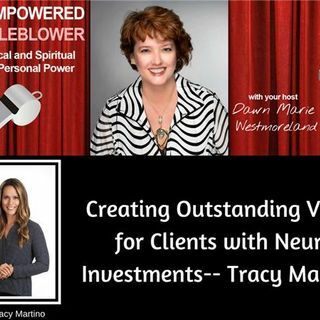 Tracy has been motivating and leading groups for 26 years on subjects of leadership, success, personal growth and communication. She is on ... See More a mission to combine the Leadership Industry with Neuroscience to help individuals and organizations create behavioral changes that will increase trust, engagement, and transform performance. She is a member of the NeuroLeadership Institute, National Association of Professional Women and local chamber groups. Recently, my expertise resulted in membership to the National Association of Experts, Writers, and Speakers and an opportunity to co-author, “Cracking the Code to Success,” with Brian Tracy.